The Tri-Lakes area is located just north of Colorado Springs and about 35 miles south of Denver and boasts some of the most spectacular scenery in Colorado. The small towns of Monument, Palmer Lake, and Larkspur and the communities of Gleneagle, Woodmoor and Black Forest comprise the Tri-Lakes, characterized by more rural living with larger tracts of land. There are many rustic homes and horse properties with opportunities for golfing as well. Contemporary homes of a wide variety are also plentiful in the immediate area and throughout the countryside. Local sites include the U.S. Air Force Academy and the Pikes Peak National Forest. Hiking, biking, and horseback riding are popular activities as well as recreational opportunities offered by the Tri-Lakes (Monument Lake, Palmer Lake and Lake Woodmoor). Monument offers more than just breathtaking views, there is hiking, fishing, camping, water skiing, snow skiing, and bike trails to name just a few. Since it is an easy commute either north or south, the area attracts professionals with jobs in either Denver or Colorado Springs. Excellent schools, great shopping districts, environmental concern, and friendly people, make this the perfect community. Monument offers social, religious, school, recreation, and business opportunities for those who prefer residence in a smaller, quieter city adjacent to the country. Monument neighbors were honored when the torch for the 2002 Winter Olympic Games was carried through their streets. Monument is a small growing rural community just 17 miles or about 20 minutes north of Colorado Springs. Located just off of I-25, it lies on both the east and west side of the Interstate and just north of the Air Force Academy. 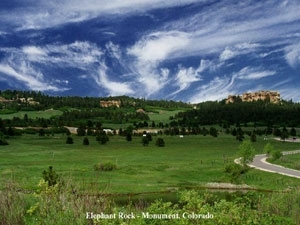 Monument offers easy access to both Colorado Springs and Denver, and sits just east of Rampart Range and Pike National Forest. 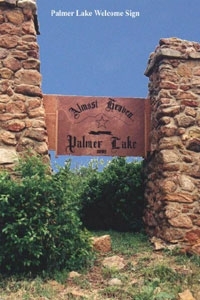 The Tri-Lakes area is situated in northernmost El Paso County, and includes Palmer Lake, the town of Monument, and the unincorporated community of Woodmoor. The Black Forest area is to the immediate east, and is situated at the high point between Colorado Springs and Denver, known as the Palmer Divide. This area is part of greater Colorado Springs closest to Denver. Many people commute to southeast Denver, just 40 miles away. Monument is located directly off of Interstate 25, about forty miles from Denver's International Airport, renowned for aesthetics, aviation safety, customer satisfaction, and passenger convenience. At 10 years old, it is the nation’s fifth-busiest airport and the 10th-busiest in the world. Monument is also only a 20 minute drive from the Colorado Springs Airport which serves 9 airlines with non-stop flights to many major hub cities, with easy connecting flights to destinations all over the world. Shuttle service and ground transportation are available at both airports. The area is serviced by Springs Transit which offers excellent transportation services to the greater Colorado Springs area and by FREX (Front Range Express Bus) which services Downtown Denver, South Denver, Castle Rock (half way point between Denver and Colorado Springs), Monument (15 miles north of Colorado Springs) and Downtown Colorado Springs. Incorporated June 2, 1879, Monument has fortunately taken wonderful efforts to preserve their history and heritage. The community has thrived economically, as has the preservation of their rich history. In the 1860’s the area was first called Henry’s Station. It was named for Henry Limbach. After the D&RG railroad was built in 1871, Henry’s Station became Monument. The name Monument was chosen for the beautiful rock formations seen to the Northwest. The first train came through the town on January 1, 1872. In 1887, the Santa Fe Railroad and station were built. The rail-lines had stockyards in Monument, and the fall became a very busy time when farmers shipped their cattle to the market. In 1889, Monument Creek, located west of town, was dammed. In 1901, Doyle and Thomas Hanks built an icehouse on the lake and started harvesting ice, which was accomplished back then by man and horse. Ice harvests would start as early as mid December with blocks of ice up to 24 inches thick being cut from the lake. 20,000 to 30,000 tons of ice was harvested annually. 4000 tons were stored in icehouses with the remainder being shipped south to Pueblo and north to Denver. To keep the ice from melting, ice cakes were packed in 12 inches of sawdust. Many homes and businesses had their own icehouses, and the stored ice would last through the summer when packed in sawdust. On New Year’s Eve 1909, a 100-mile per hour wind completely destroyed the Monument icehouses the day before an ice harvest was to begin. The icehouses had to be diligently rebuilt.